Product prices and availability are accurate as of 2019-04-21 19:31:41 EDT and are subject to change. Any price and availability information displayed on http://www.amazon.com/ at the time of purchase will apply to the purchase of this product. 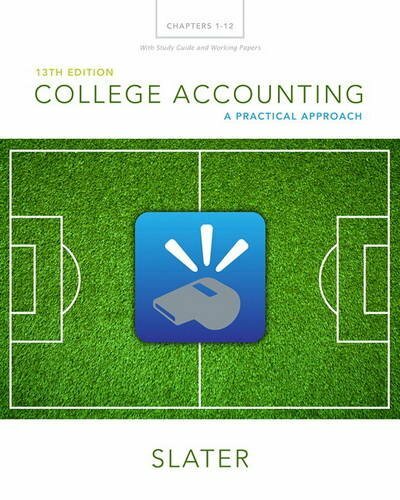 For college Accounting and Bookkeeping courses. This package includes MyAccountingLab ® . College Accounting Chapters 1-12 with Study Guide and Working Papers provides a strong foundation in the basics of accounting. The material is organized in a clear, easy-to-follow format, and each chapter contains a plethora of learning tools and practice materials to help students immediately put their skills to use. The Thirteenth Edition stays current with modern accounting tools and techniques and includes updated computer workshops using Sage 50 and QuickBooks. Students are also introduced to new trends in banking technology and updated tax information.